Here is a little gem from Proverbs 24:10 I read today. “If you falter in times of trouble, how small is your strength!” The key word is, “If”. That means we have a choice. We don’t have to falter. Then why do we? I suspect in times of trouble that we are all guilty in some way of going it alone or seeking the world’s attention or basting in our own misery, but there is a better way! I find my strength is increased when I turn to the Lord, when I am comforted by the faithful and when I reject the well intend, but unharnessed fear and anxiety of others. When Jeremiah questioned God because of the troubles he faced, God asked him how he ever expected to face big challenges if the little ones tired him out. See Jeremiah 12 for the full context. Who are we to say if the challenge we are going through is a big one or little one? God will use it to grow us, grow others and prepare us for even bigger things. I return to MD Anderson today for another PET scan and to meet with a Neurosurgeon. The good folks at MDA have been tracking what they are calling a "dark spot" since they declared me cancer free a year ago. They do not know what it is and have attempted to make educated guesses with no success. One doctor literally told us that he had never seen anything like it. How is that possible? These folks deal with this everyday - for them not to know is mind boggling. I suspect more for them than for us. I guess that simply proves that God is in control and has not given them the wisdom to know yet. The "dark spot" is located in the same area my cancer was located. It is located in my clivus area, carotid canal and along the underside of my skull. The tests leading up to our meeting today continue to show that the cancer is still gone. The purpose of today's meeting is to meet with the neurosurgeon so that he can weigh the risk of doing nothing to doing surgery. In there mind, if it isn't supposed to be there and it is growing, they should remove it. In my mind, I should wait on God to make that determination. God has taken me to a place of peace and assurance. He has convinced me that he wants me to wait on Him. So, I am. How am I doing that? By living in the now. My family has been helping a long time friend with some general maintenance around her home. She texted me one day and said it was too hot and that I don't have time. My response to her was simple and straight forward and as it turns out is somewhat profound. I told her that I have "nothing but time". Think about, that's all any of us have to offer. Whether that is one minute, one hour, one day, one year, one task, one act of love … it all comes down to one thing, time. We all have time. What we choose to do with it is up to us. As I wait on God, I get to serve Him. How cool is that? Have you ever stopped and asked yourself the question, "What is worship?" Worship is appreciating God for his nature and worth. Worship is being in the presence of God. We worship Him to know Him better and that starts with being present. Being present sounds simple, but how often does your mind drift, an activity pop up or someone needs something from you? How often do we stop worshipping to handle the thing that interrupted our worship? What if it didn't have to be that way? Like many of you, I have allowed too many distractions to interrupt my worship. It doesn't need to be that way. We can worship before, during and after our godly interruption. What if we were in the state of worship all the time? What if we viewed the world the way God views the world and intended for us to view the world? So, what does the "state of worship mean? It means to "be present" and "stay present" with God all the time. Like me, you probably studied a long time ago that worship was the primary focus of many Israelites. For many, this was what they did daily. Everything they did centered around serving in the house of the Lord. Worship should occupy the core of our lives. Many of us attend church on a regular basis and even attend some type of mid-week activity, but is that what "the core of our lives" is talking about? I don't think so! The core of our lives is lived out daily and in every thought, word and action. We are called to be in a state of worship at all times no matter how good something is or how bad something is - we should worship none stop. In order to do that, we need to seek and be in the state of worship all the time. We need to be aware of it when we wake, when we go to work or school, when we serve or when we tend to our families or other personal relationships. All the time! We can worship at all times if we will stay present with God and be aware of His presence in us. He will guide us and tend to us at all hours just as we are to be present with Him at all hours. We need to build our entire life around worshipping God rather than making worship just another activity in a busy schedule. What is keeping you from being present and worshipping God at all times? I just named mine, so, won't you take a moment and pray the prayer below and then from this day forward, seek to be present and to worship him as you go through your day. Don't let the distractions of this world prevent you from putting or keeping God first above all. Prayer: Father God, whatever each of us just named, please take it away or help us to put you above it. Help us to pursue you by reading your word, by praying and by serving others. Please let our distractions become opportunities to glorify you in the process. Healing for me is about believing. It is about knowing the promises of God and then believing them. I believe He can and will heal every ailment according to His purpose. He can and will chase down every cancer cell, every ailment, every ache and pain and take them under His control. We need to give it up as God is in the house. No worries, no fretting, and no holding back. Get all-in and be all-in on believing. So what are we to do while we wait on that healing? We are to glorify God in the midst of our cancer, our illness, our pain and our suffering. We are NOT to waste this opportunity to glorify God by turning into ourselves, but rather we need to turn out to others. What will they see from us? What do they see from us? Is my response sufficient, is it right and does it bring glory to our almighty God? Is it pointing to Jesus or is it pointing to me? Is my suffering glorifying God? If you are caught up in some ailment, turn it over - give it up - let go of it - it is not yours. Free yourself, while you wait for healing and His mercy to be revealed. God will use you if you let Him. Who knows how He will use you or how He will heal you or when He will heal you, but know this; He will be glorified before you and before the world as you point to Him. While you pray, while you wait in expectation and while you believe for a miraculous healing - ask God to show you how to trust Him more and to increase your faith more. Ask Him to use your suffering to draw you closer to Him - to draw others closer to Him. He loves us - this I know! Isaiah 41:10 ESV says, "Fear not, for I am with you; be not dismayed, for I am your God, I will strengthen you, I will help you, I will uphold you with my righteous right hand." Who can hide from God? No one! Where are you going to try to hide from the presence of God? You may block Him out of your mind for a moment, but you can’t hide from God. Where “would you” or “do you” go to try to hide from God? Maybe you answered, “I don’t hide from God.” If that is the case, let’s take an inventory. Think about and write down your personal vices that are inconsistent with God’s Word, make a list of what you say, and more importantly, what you think, that can’t be found in scripture and consider what you watch or read and ask yourself if you would invite God to join you? Maybe your hiding places are subtler and aren’t quite as obvious. Maybe you hide behind your prestige and self-importance; your talent; your success; your money; your pride, your insecurity, your looks; or maybe even an addictive substance, such as alcohol, legal or illegal drugs, sugar, or people you hang or run with. 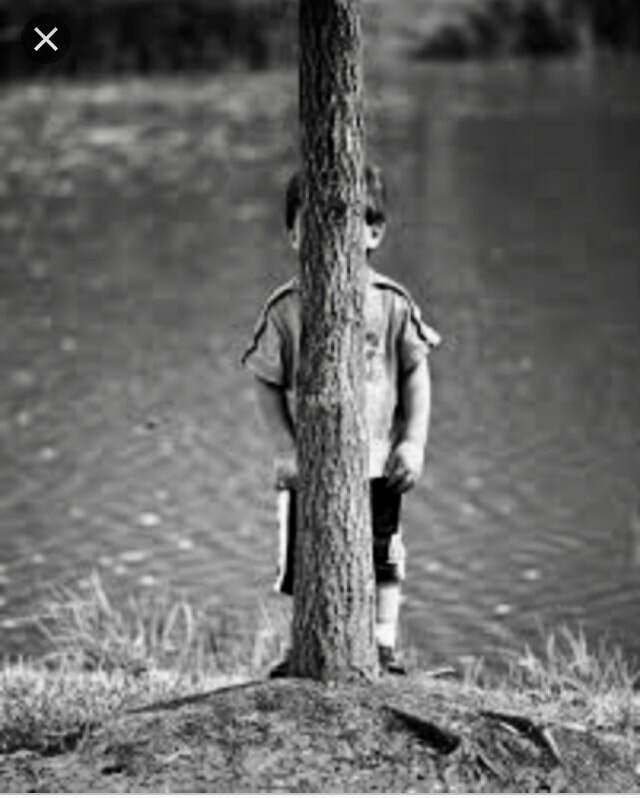 If you are trying to hide from God, it is a feeble effort. You don’t want to hide or be distant from God. Nobody does! When there is danger, where do you want God - close to you, with you, and inside you. Oddly, when you want to sin, you want to do the opposite and block Him out of your mind, but that’s too late, He has always existed and is always present. You can’t escape, hide, or block out a Holy God that loves you. He loves you so much, He sent His Son, Jesus, to die to take away the penalty of your sin. He sent His Son because He loves you, He wants a relationship with you, and wants to save you. There seems to be no excuse for sinning against God and pretending He doesn’t exist or isn’t present. There is no hiding from a God that loves you. He allows you to live free of the fear of the penalty of your sin. All you must do is truly accept Jesus into your heart and you will be freed from the agony of the future without Him. Maybe you say, “I’m not into the Bible.” Well, it is better if you get into it soon. Knowing God, is to love God! That’s when you will be set free. That’s when you will pursue Him. That’s when you will embrace the fact that you were created in the image of God and that you can live according to His ways and His qualities. Qualities that are of God. Qualities you share with Him. Here are three of the qualities you received from God, yet many try to block them out. You received your personality, your morality, and your spirituality from a God that loves you. God defined your qualities, not you; you are created in His image. You can’t change that. If you don’t believe it, look in the mirror and look into your heart - who do you see? The image of God! Maybe some of you can clearly see Him in you. Maybe some of you can’t. Look deeper, He is there. He wants to come to the forefront of your life. Don’t be afraid to embrace the fact that He is in you. Let Him out. Let Him become the center of your life. Let’s all measure our qualities against those God has imparted to each of us. Let’s accept His personality as our own, let’s live moral lives according to His standard in Scripture and nowhere else, and let’s intentionally get to know Him by spending time in His word daily. 2,000 years later and we have the same mission – “to prepare the way”. Now how is that for a mission statement. Pretty clear and concise. It leaves no doubt as to what we are to do. Should our response be any different? What if our place to follow is right where we are? What if he calls us away to another place, will we go? Both Simon and his brother Andrew became great fishers-of-men – why? Because, they acted out of obedience. They responded immediately. They didn’t wait for confirmation, they didn’t wait until they saved up enough money, they didn’t wait until they were better educated, they didn’t wait until they read the whole Bible, they didn’t wait until the time was right and they didn’t wait until they knew the future. They simply dropped their nets and followed him. Hopefully, you have or will drop your nets right where you are and as a result, “are preparing the way” with the people God has entrusted to you. Are you sharing the good news or keeping it to yourself? I find it interesting that Jesus strongly told the Leper not to tell anyone, but he did just the opposite. Jesus wanted him to keep it to himself, so he could continue to fly under the radar as he preached, but the Leper told everyone. Jesus wanted him to just give God the glory through his offerings and his testimony, but he couldn’t hold back from sharing the good news. I am sure, we would be the same way. Good news is hard to contain. Can you imagine if every Christian told one person the good news today, how fast it would be spread? It would be unstoppable. If Jesus started his day with prayer, shouldn’t we? In fact, he started, “very” early in the morning. What is “very early” for you? I suspect it is different for everyone, but I believe the point is that we should pray before we do anything else. Otherwise, who will we get our direction and guidance from? How we know what is off God and what is of self? I also like the fact that he prayed in solitude, meaning, he did not announce that he was going to pray, and he didn’t make a public spectacle of himself, he just went to be alone with the Father and commune. How much more should we do the same. All of Lane’s scans were clear. This news overwhelms our hearts and brings tears of joy! Please join us as we fall to our knees and give prayers of thanksgiving for the Lord’s mercy on Lane. It is truly a gift and a miracle! Thank you for your prayers! Your prayers have been answered and you have proven to be powerful prayer warriors! I returned to Houston Saturday night for my first follow up appointment since being declared cancer free on July 5th. I completed my labs and 3D MRI yesterday morning and will meet with various doctors today. My belief is that the doctors will reconfirm what God has already done - that is, he brought glory to himself when he healed me. However, I don’t believe that my healing was the full extent of his glory. I believe those who became believers for the first time, those who saw their faith increase exponentially and those who walked in faith with me the entire time, brought far more glory to God than my trial ever did or could. Many have asked me why God healed me and not their parent, child, spouse or friend. The truth is, I don’t know why, and I don’t think any of us will know while we are on this side of eternity. My belief is that God answers all prayers in his mercy and according to his purposes. His mercy begins with our greatest need - the need to be forgiven of our sins. He offered us all forgiveness through Jesus his son. It’s ours to receive. He heals our soul when we believe. Then he directs his mercy to each of our situations and our trials. If we believe that God Loves us, it is easy to see him offering us mercy. What is sometimes difficult to see or understand for most of us, is how God answers our prayers. I believe that no matter what our prayer is, he provides us the solution that will further his kingdom and bring him the most glory. When we agree with his answer to our prayer, our faith deepens and grows like wildfire, as does the fire inside all those around us. So, for me, I trusted God from the beginning and God doesn’t contradict himself, so I continue to believe with all my heart, mind and soul that God took my cancer away. I have no doubt. I am calling on you to join me. Let’s lift our faith and give God all the glory. Where do you need to trust God? On July 5th, my wife and I received amazing news. News that changed our lives. We were told that I was cancer free. Praise God! TGBTG! As I reflected on that news over the last ten days, my outlook on life seemed different. Everything I did seemed to have new meaning and new purpose. My response changed. I realized, "I get to ...". Like many of you, I would make a list every week and then seek to knock it out at all costs. I would figure out what I needed to get done, who I needed to call to help me and how long it would take – so I could move on to the next task. My approach has changed. I still make the same list, but I look at it from a different perspective. I look at it and say to myself, “I get to do such and such and I get to do it with so and so”. I found that my natural “getter done at all costs” personality and my “drive it until it is complete” nature had shifted. I found myself being more docile, more agreeable, and less argumentative. I found that I was being kinder and friendlier. I was seeking common ground. Mutual help. I found myself seeking harmony and reconciliation above all. I was complaining less about things and about people. The standard I was holding people to was high, very high. I backed off my self-imposed standard to meet them where they were and to see how I could help. Why, because it still gets done and life is short, very short. Life is too short not to have relationship be more important than task. I didn’t lose my passion. Several times this week, I had to hold my tongue, eat my words, or change my thoughts so that I didn’t allow my passion to turn to pride and destroy a relationship. I had to slow down and allow for buy in, to allow for understanding and to allow for growth. I had to realize that my way wasn’t the only way. I had to humble myself. I still desire to achieve at high levels, but I lost my desire to do it at the cost of a relationship. Relationships come first. People are important. They are the most important thing. My response is simple, “I get to …”. Not just that “I get to … but that, “I get to love”, first. This is not a new idea to me, as I love people. However, as I reflect back, I didn’t always lead with love. I would get things out of order and sometimes I would forget that I am dealing with people and people deserve love first, above all. We are called to “lead with love” just as our father in Heaven did. Jesus laid down his life out of love. He died on the cross just so we don’t have to suffer in Hell for eternity. He made a way for us to live in love forever. His sacrifice is evidence of His love for all of us. My prayer for you, if you want to join me, is to remember to love first. Jesus’s example of sacrificial love is the highest form of love one can give. As you go throughout your day, I hope you will remember that “you get to lead with love”, too. People matter. Let’s get the word out. No excuses, no guarded responses, and no politically correct phrases … speak the truth in love and remember that “you get to” change lives one at a time forever. I love you all and can’t wait until our paths cross again and “we get to love” together. DAY 44 - WHAT'S NEXT? Many have asked what the next steps are after I finish treatment on Thursday, April 20, 2017. This is what I know so far, they will have completed the maximum number of radiation (33) and chemo (6) treatments they can safely apply in order to a eradicate my cancer. So now, please join me in giving God all praise and glory for his miracle of healing. Truly, please get on your knees with me and give Him thanks. In my mind and in my heart, it is finished. Our God is an awesome God. I came here to be part of a miracle and I believe that I was. I also believed the entire time, that every single prayer warrior on this journey with me, was part of my miracle as well. That being said, MD Anderson is not done. The first two weeks following treatment, I will spend my time managing through post-treatment side-affects, as they occur. In early May, I will return home to finish my recovery. We originally intended to stay in Houston for the month of May, but in order to save a month of rent and also to hurry up and get home to see our kiddos, we have elected to recover at home. This is a very tricky time. I need to avoid anybody or anything that could expose me to sickness or infections that my immune system isn't prepared to battle. I need to focus on rebuilding my immune system to fight for me. They indicated that I need to be on the guard for 2-4 weeks. Basically, they want me to stay on high alert through the end of May. I don't know what that looks like today, but I will share more as I learn about it. In late June, MD Anderson would like us to return for a final assessment wrap up. Whenever this is scheduled, it will take 2-3 days. Two weeks after the final assessment, they will coordinate with us for a final consultation meeting with the care team. We project that to be mid-July. Normally, waiting would be a cause for anxiety or fear, but in this case, we all need to remember that we are part of a miracle and we get to finish where we started ... on our knees giving God the glory. I pray that each of you will turn to God and keep your eyes on Him and not on the things of this world. Remember, Peter walked on water and walked towards Jesus, until he turned His eyes on the storm and then sank. Jesus in his compassion saved Peter even though he doubted. To turn your eyes on anxiety or fear now is the same as turning your eyes towards the storm - you do not want to do that as it may just reveal that you have been praying and hedging your faith with an element of doubt. There is no need to do that as you are already part of the miracle. 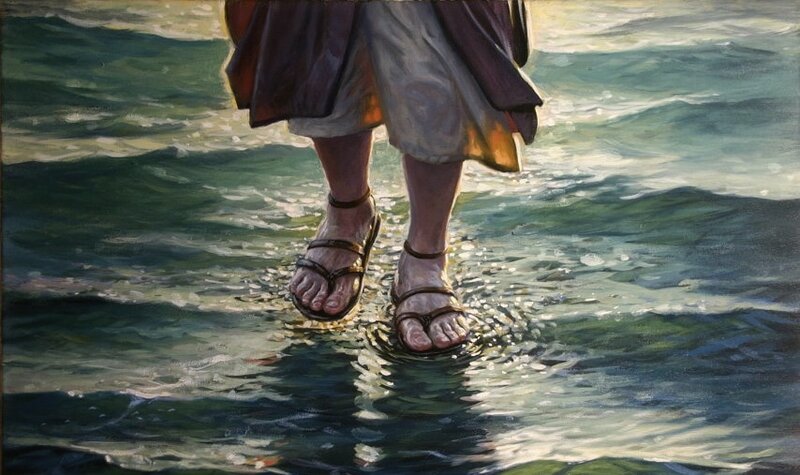 We are walking on water with Jesus. I am thankful for each of you and for continuing to walk this journey with me. You are so faithful. You are Prayer Warriors! I am especially thankful for my wife and all she does for me and is doing for me. I could not have done this without her by my side in every way. The doctors praised her each time they saw how well the battle was going. They were surprised each and every week. They shouldn't have been - have you met my wife, Stephanie? She is amazing! Of course I am most thankful for Jesus and how he owns my heart. He is everything and He is the only thing any of us needs. As I mentioned previously, it is all up to you to invite Him into your heart, like I did. If you haven't, now is the time. Don't wait. I love each and every one of you and give great thanks for all that you have done to share Christ and to support our family to date on this journey. Now let's continue to be walk on water kind of believers! DAY 43 – WHAT IS THE ONLY THING YOU ARE IN CONTROL OF? WHAT IS THE ONLY THING YOU ARE IN CONTROL OF? Merriam-Webster defines “control” as having the power to influence or direct people’s behavior. Over the years, I have been fortunate to coach, teach, manage, and lead others to success, but never once did I think I was in control, but I knew who was. I remember coaching a U16 all girl soccer team and somehow thinking I was in control of the practices – after all, I was the coach. Not! I held a player meeting and simply asked them, “What do I need to do to get you to practice hard and not goof off?” One of the girls spoke up and simply said, we need time to talk to each other. Being a dumb male coach, I said, “What do you mean?” Once they explained it in terms I could understand, I changed the practice to accommodate them. To get the best out of my players, I needed to learn from them and give up control. I needed them to tell me how to help them be successful. Have you ever considered the possibility that “control” is simply an illusion and does not exist? Maybe, we are looking in the wrong place? Take a moment and scroll down to read ALL the scriptures posted below. They will declare who is in control in every aspect of life. Let them speak to you about who He is and how He is with you all the days of your life. What you believe! You and only you, get to make that decision. It is the only decision that has eternal significance and it is up to you. What do you believe? Those who believe … they are all in and sold out! They chose to believe in and follow Jesus. Those who don’t believe … they are lost. They have heard it and rejected it or they simply haven’t considered the truth. They chose not to follow Jesus and instead they tend to follow the ways of the world, which includes following false religions. It’s not too late, if that is you, you can change that right now by simply praying and asking Jesus into your heart as your Lord and Savior. Those who believe, but are living with pain … they are suffering. At some point in their life, their faith was shaken. They now live day in and day out with pain or doubt from the past. Their heart may have become hardened and the pain may have imprisoned them, but now they need reconciliation and they need their faith to be restored. People in this category tend to avoid any conversation about faith, they tend to say things like “thoughts” or “positive vibes” or anything else to avoid giving any power or authority in faith to Jesus. They may be holding on to a time they prayed and they didn’t see God act. Sometimes fear drives these responses. People do everything they can to avoid being hurt or suffering again, so they deflect it rather than embrace it. It doesn’t have to be that way, you can turn and run to God - not away. He loves you and wants to restore you. He wants to make you whole. Just talk to Him and he will fill your void and restore you to a right relationship with him. There is nothing you did or could ever do that prevents Him from loving you. Come as you are and allow Him to minister to your heart. If you are reading this blog, I am praying for you. I am praying for your faith to increase, or I am praying for you to accept Jesus into your heart or I am praying for your relationship to be restored. I love ya and Jesus loves you more! Proverbs 19:21 ESV - Many are the plans in the mind of a man, but it is the purpose of the Lord that will stand. Romans 8:28 ESV - And we know that for those who love God all things work together for good, for those who are called according to his purpose. Jeremiah 29:11 ESV - For I know the plans I have for you, declares the Lord, plans for welfare and not for evil, to give you a future and a hope. Isaiah 45:6-7 ESV - That people may know, from the rising of the sun and from the west, that there is none besides me; I am the Lord, and there is no other. I form light and create darkness, I make well-being and create calamity, I am the Lord, who does all these things. Isaiah 41:10 ESV - Fear not, for I am with you; be not dismayed, for I am your God; I will strengthen you, I will help you, I will uphold you with my righteous right hand. Isaiah 55:8-11 ESV - For my thoughts are not your thoughts, neither are your ways my ways, declares the Lord. For as the heavens are higher than the earth, so are my ways higher than your ways and my thoughts than your thoughts. “For as the rain and the snow come down from heaven and do not return there but water the earth, making it bring forth and sprout, giving seed to the sower and bread to the eater, so shall my word be that goes out from my mouth; it shall not return to me empty, but it shall accomplish that which I purpose, and shall succeed in the thing for which I sent it. Matthew 6:34 ESV - “Therefore do not be anxious about tomorrow, for tomorrow will be anxious for itself. Sufficient for the day is its own trouble. Proverbs 16:9 ESV - The heart of man plans his way, but the Lord establishes his steps. Proverbs 16:4 ESV - The Lord has made everything for its purpose, even the wicked for the day of trouble. Job 12:10 ESV - In his hand is the life of every living thing and the breath of all mankind. Psalm 22:28 ESV - For kingship belongs to the Lord, and he rules over the nations. Psalm 115:3 ESV - Our God is in the heavens; he does all that he pleases. Isaiah 45:7 ESV - I form light and create darkness, I make well-being and create calamity, I am the Lord, who does all these things. 1 Corinthians 10:13 ESV - No temptation has overtaken you that is not common to man. God is faithful, and he will not let you be tempted beyond your ability, but with the temptation he will also provide the way of escape, that you may be able to endure it. Hebrews 2:8 ESV - Putting everything in subjection under his feet.” Now in putting everything in subjection to him, he left nothing outside his control. At present, we do not yet see everything in subjection to him. 1 Chronicles 29:11 ESV - Yours, O Lord, is the greatness and the power and the glory and the victory and the majesty, for all that is in the heavens and in the earth is yours. Yours is the kingdom, O Lord, and you are exalted as head above all. Exodus 9:16 ESV - But for this purpose I have raised you up, to show you my power, so that my name may be proclaimed in all the earth. Jeremiah 32:27 ESV - “Behold, I am the Lord, the God of all flesh. Is anything too hard for me? Romans 9:21 ESV - Has the potter no right over the clay, to make out of the same lump one vessel for honorable use and another for dishonorable use? Proverbs 21:1 ESV - The king's heart is a stream of water in the hand of the Lord; he turns it wherever he will. Matthew 10:29 ESV - Are not two sparrows sold for a penny? And not one of them will fall to the ground apart from your Father. 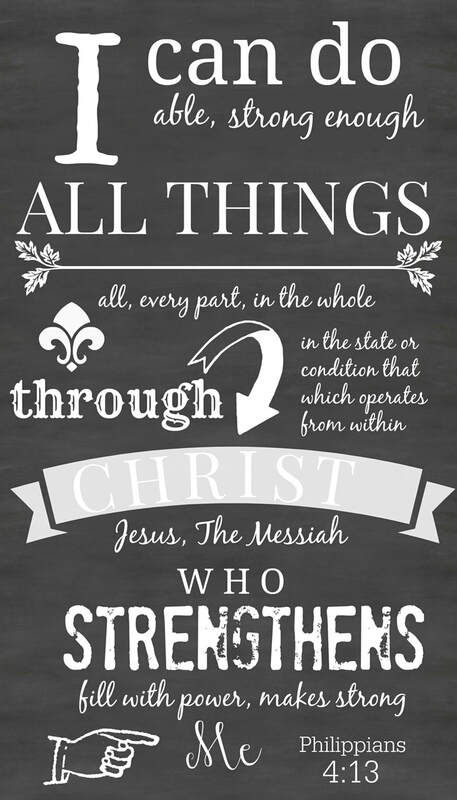 Philippians 4:13 ESV - I can do all things through him who strengthens me. Jeremiah 10:6-10 ESV - There is none like you, O Lord; you are great, and your name is great in might. Who would not fear you, O King of the nations? For this is your due; for among all the wise ones of the nations and in all their kingdoms there is none like you. They are both stupid and foolish; the instruction of idols is but wood! Beaten silver is brought from Tarshish, and gold from Uphaz. They are the work of the craftsman and of the hands of the goldsmith; their clothing is violet and purple; they are all the work of skilled men. But the Lord is the true God; he is the living God and the everlasting King. At his wrath the earth quakes, and the nations cannot endure his indignation. Genesis 50:20 ESV - As for you, you meant evil against me, but God meant it for good, to bring it about that many people should be kept alive, as they are today. 1 Chronicles 29:11-12 ESV - Yours, O Lord, is the greatness and the power and the glory and the victory and the majesty, for all that is in the heavens and in the earth is yours. Yours is the kingdom, O Lord, and you are exalted as head above all. Both riches and honor come from you, and you rule over all. In your hand are power and might, and in your hand it is to make great and to give strength to all. Psalm 9:10 ESV - And those who know your name put their trust in you, for you, O Lord, have not forsaken those who seek you. James 1:13 ESV - Let no one say when he is tempted, “I am being tempted by God,” for God cannot be tempted with evil, and he himself tempts no one. Romans 8:31 ESV - What then shall we say to these things? If God is for us, who can be against us? Isaiah 14:27 ESV - For the Lord of hosts has purposed, and who will annul it? His hand is stretched out, and who will turn it back? Revelation 1:17-18 ESV - When I saw him, I fell at his feet as though dead. But he laid his right hand on me, saying, “Fear not, I am the first and the last, and the living one. I died, and behold I am alive forevermore, and I have the keys of Death and Hades. John 14:6 ESV - Jesus said to him, “I am the way, and the truth, and the life. No one comes to the Father except through me. Proverbs 29:26 ESV - Many seek the face of a ruler, but it is from the Lord that a man gets justice. Psalm 27:1 ESV / Of David. The Lord is my light and my salvation; whom shall I fear? The Lord is the stronghold of my life; of whom shall I be afraid? 1 Peter 5:7 ESV / Casting all your anxieties on him, because he cares for you. Acts 2:23 ESV / This Jesus, delivered up according to the definite plan and foreknowledge of God, you crucified and killed by the hands of lawless men. Isaiah 55:8 ESV / For my thoughts are not your thoughts, neither are your ways my ways, declares the Lord. Genesis 1:1 ESV / In the beginning, God created the heavens and the earth. 1 John 1:5 ESV / This is the message we have heard from him and proclaim to you, that God is light, and in him is no darkness at all. Philippians 4:6-7 ESV / Do not be anxious about anything, but in everything by prayer and supplication with thanksgiving let your requests be made known to God. And the peace of God, which surpasses all understanding, will guard your hearts and your minds in Christ Jesus. 1 Samuel 2:6-7 ESV / The Lord kills and brings to life; he brings down to Sheol and raises up. The Lord makes poor and makes rich; he brings low and he exalts. Psalm 34:7 ESV / The angel of the Lord encamps around those who fear him, and delivers them. 2 Chronicles 20:15 ESV / And he said, “Listen, all Judah and inhabitants of Jerusalem and King Jehoshaphat: Thus says the Lord to you, ‘Do not be afraid and do not be dismayed at this great horde, for the battle is not yours but God's. Exodus 14:13 ESV / And Moses said to the people, “Fear not, stand firm, and see the salvation of the Lord, which he will work for you today. For the Egyptians whom you see today, you shall never see again. John 14:27 ESV / Peace I leave with you; my peace I give to you. Not as the world gives do I give to you. Let not your hearts be troubled, neither let them be afraid. Genesis 1:2 ESV / The earth was without form and void, and darkness was over the face of the deep. And the Spirit of God was hovering over the face of the waters. 1 John 4:18 ESV / There is no fear in love, but perfect love casts out fear. For fear has to do with punishment, and whoever fears has not been perfected in love. Psalm 135:6 ESV / Whatever the Lord pleases, he does, in heaven and on earth, in the seas and all deeps. John 17:17 ESV / Sanctify them in the truth; your word is truth. John 3:16-17 ESV / “For God so loved the world, that he gave his only Son, that whoever believes in him should not perish but have eternal life. For God did not send his Son into the world to condemn the world, but in order that the world might be saved through him. Psalm 46:1 ESV / To the choirmaster. Of the Sons of Korah. According to Alamoth. A Song. God is our refuge and strength, a very present help in trouble. Psalm 34:19 ESV / Many are the afflictions of the righteous, but the Lord delivers him out of them all. Ephesians 1:11-12 ESV / In him we have obtained an inheritance, having been predestined according to the purpose of him who works all things according to the counsel of his will, so that we who were the first to hope in Christ might be to the praise of his glory. Psalm 94:19 ESV / When the cares of my heart are many, your consolations cheer my soul. Luke 21:8 ESV / And he said, “See that you are not led astray. For many will come in my name, saying, ‘I am he!’ and, ‘The time is at hand!’ Do not go after them. Psalm 23:4 ESV / Even though I walk through the valley of the shadow of death, I will fear no evil, for you are with me; your rod and your staff, they comfort me. Isaiah 40:31 ESV / But they who wait for the Lord shall renew their strength; they shall mount up with wings like eagles; they shall run and not be weary; they shall walk and not faint. Joshua 1:5 ESV / No man shall be able to stand before you all the days of your life. Just as I was with Moses, so I will be with you. I will not leave you or forsake you. Philippians 4:19 ESV / And my God will supply every need of yours according to his riches in glory in Christ Jesus. Romans 13:1 ESV / Let every person be subject to the governing authorities. For there is no authority except from God, and those that exist have been instituted by God. Romans 8:29-30 ESV / For those whom he foreknew he also predestined to be conformed to the image of his Son, in order that he might be the firstborn among many brothers. And those whom he predestined he also called, and those whom he called he also justified, and those whom he justified he also glorified. Revelation 3:7-8 ESV / “And to the angel of the church in Philadelphia write: ‘The words of the holy one, the true one, who has the key of David, who opens and no one will shut, who shuts and no one opens. “‘I know your works. Behold, I have set before you an open door, which no one is able to shut. I know that you have but little power, and yet you have kept my word and have not denied my name. Zechariah 4:6 ESV / Then he said to me, “This is the word of the Lord to Zerubbabel: Not by might, nor by power, but by my Spirit, says the Lord of hosts. Jonah 1:4 ESV / But the Lord hurled a great wind upon the sea, and there was a mighty tempest on the sea, so that the ship threatened to break up. Amos 3:6 ESV / Is a trumpet blown in a city, and the people are not afraid? Does disaster come to a city, unless the Lord has done it? Psalm 55:22 ESV / Cast your burden on the Lord, and he will sustain you; he will never permit the righteous to be moved. Psalm 31:14-15 ESV / But I trust in you, O Lord; I say, “You are my God.” My times are in your hand; rescue me from the hand of my enemies and from my persecutors! My boss, Stan, asked me today how I was doing? It seemed like a simple enough question, but not one that I focus on much. I view it much like a foot race and I am a little more than half way through. My focus is one day and one week at a time. Anyway, I wanted to just share it openly with the rest of my faithful "Prayer Warriors". Treatment is going great with my side-affects staying somewhat controlled. The docs think I am doing better than expected. Last Monday they told me the honeymoon was over and that it starts to get worse from here on out. First of all, I have never thought of it as a honeymoon, but to their point, the side-affects have worsened, but are under control. I learn something new every week that I couldn't have known the week before. As an example, when they say the treatment is cumulative and progressive, they mean the side-affects are cumulative and progressive. They don't mean the treatments are ... the treatments are immediate. In other words, if they radiate today, I get the full impact of it today, but need to go again tomorrow to get another dose. Same with the chemo, if I get it on Monday, it begins working immediately and lasts about five days. Then its time for another bag of chemo. I did have a bit of a slump mentally following the 3D MRI. While they were incredibly pleased, I had expected more - which I had no reason to expect more, but I did. It bothered me for about a week. Since that time, I am back on top of the world. I am so thankful for this treatment, I have a better understanding of what we are doing to eradicate it and how it works. I am thankful for all those who have reached out to us and I give God praise that he is allowing me to walk this walk in faith. Quite honestly, I don't know how I would do it with out it. I have seen a lot in just five weeks, but I have learned that disease, such as cancer, does not discriminate. It attacks young, old, male, female, black, red, white, yellow, Christians, non-Christians ... you name it. I have also learned, people deal with it differently. Some are mad, sad, frustrated, ready to quit, etc. I just find myself faithful. I would say there are more here relying on their faith, than not. I believe the patients may have more faith than the doctors, not all, but some. Interestingly, I have learned what the limitations of the doctors are and that no matter what the treatment is, they can only go so far. The rest, as one-doctor told me, is beyond them. So, I keep following the protocol and doing what I am told to do. My wife is enjoying that, I think. She can't accuse me of not listening. She is very persistent. Hopefully, it will pay off and I won't be fighting the side-affects like those who don't do what they are supposed to do. The only real challenge I have right now is that I have no taste or smell, so I have no desire to eat. I have to eat because my body is consuming calories at an alarming rate. If I sit sedentary and don't do anything, I use about 3,000 calories, which isn't enough to keep me from losing weight. I also have to make sure there are 130-150 proteins per day included in my calories so that I can grow new cells and repair the ones that are getting torn apart. Trust me when I tell you, it is hard to eat 3,000+ calories per day and 150 protein when they all taste like cardboard. As a little aside, before coming to Houston, I decided to put on a few extra pounds since I was going to lose some weight while I am here. I was successful and gained 14 extra pounds, but I have now lost all of it plus four more. My goal is to stay at this level and not lose anymore. I can't or they will stop treatment or put a feeding tube in me. That's not going to happen. Happy cardboard munching away! One unique side-affect is after I receive chemo on Monday, I have hiccup like spasms for 1-2 days, which makes it somewhat difficult to carry on a conversation. Normally, on Tuesdays, I have them from sun up to sun set, with Wednesday trailing off. I am thankful for all the homemade recipe recommendations on how to cure hiccups. They were creative, but I just can't stand on my head, drink a cup of water and eat a spoonful of peanut butter at the same time - so I took a pill to help stop the spasms. Seems to work better. Just for fun, here is my latest attempt at a poem / rhyme. I like to write something to motivate me each Monday as I kick off another week. Rest my child and don't say a word, daddy is revealing a miracle, I heard. Trust in me and let it be, as many will see and turn to me. You are free, you are free falling. As you fall give God your all, He will catch you in His arms as you reach out and call. Continuous and successful management of the symptoms and side-affects. DAY 10 & 11 – LET’S PRAY FOR OTHERS! Prayer Warriors, let’s pray for one another today! Let’s lay it out there, what do you need prayer for today? I like to encourage prayer because it is our opportunity to have a conversation with God about things that matter to us, to others, and most importantly to Him. I want to get us started with a couple of verses below, but first, you should know that these verses are not just any verses – they are verses one of our “Prayer Warriors” wrote out for us. She chooses to stay anonymous, but the amount of love and care she took needs to be shared. She wrote out 60 handwritten scriptures, then prayed over us with each one, and then placed each one in a separate sealed envelope for us to open each day. We are like little kids at Christmas as we select one each day to see what encouragement God has for us. Let me summarize these verses … Jesus is telling us to never, never, never give up in pursuing God. Sometimes we make it too easy to give up. We throw down a couple of halfhearted prayers and conclude that God cannot be found. Then we quit. If anyone knows me, they know it is not in my vernacular to quit. It isn’t over until it’s over … and that’s never. My mode of operation in everything I do is to strive on with resilience. Resilience means the capacity to recover quickly from difficulties; toughness. To know God takes faith, focus, and follow-through, and Jesus assures us that we will be rewarded. How is your follow-through? Mine isn’t always the best, but it is certainly getting better as I submit to the Spirit. It causes me to pursue Him, praise Him and give Him thanks. Sometimes, I never get around to sharing my needs and desires. How crazy is that? Taking time with Him draws us into Him and builds our relationship with Him. Keep pursing Him. Never cease. I would like to suggest and call us to prayer for others. List their name and a summary of their situation; if you have their approval and let us all join in! Stephanie and I have known Meg and Greg since they moved here from Midland, Tx. Our daughter, Heather and Janie were one of 10 that ran around together throughout high school and college and still do today. Our son Ryan and Matt were tied at the hip for so many years and are still friends today. Meg Muhlinghause was diagnosed with a brain lesion which is glioma. Meg had been experiencing numbness on the left inside of her mouth and assumed it was either a sinus infection or TMJ. She had an MRI on December 23rd and the pre-biopsy opinion was that it was a glioma. The biopsy on February 15th confirmed the diagnosis. Meg started radiation treatment on March 8th and chemo on March 9th. She has radiation Monday – Friday and chemo every day for six weeks. Meg is married to Greg and they have been married for 33 years. They have two children, Janie, last year residency in pediatrics and Matt, engineering student at OU. Prayer: Father God, I pray for complete healing over Meg. I pray that her body is generating good cells at a rapid rate and heal her. I pray for the glioma to be eliminated and non-existent. I pray for her endurance while taking treatment. I pray for her dependence on you during her healing. May her spirit be quieted and at peace. I also pray for Greg as a husband and as a father. 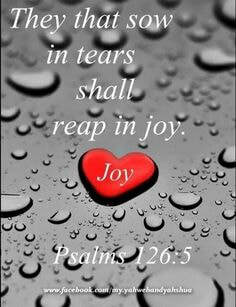 May he be comforted and know that you are with him as he leads this charge with Meg. May he trust God with Meg’s healing. May he also be there for Janie and Matt to encourage them and build them up. May his thundering laugh be at the center of every get together. May the joy ring out loudly for all to hear as they celebrate their trust and love for You. May they know that they are all loved greatly and that many Prayer Warriors are praying for them. #PrayerWarriorsMatter! Calling all prayer warriors to pray for Meg, Greg, Janie, and Matt. Post your prayers for others by hitting reply. Please note, you do not need to put your email address or a website, your name and prayer are all that are needed. DAY 9 - WHAT IS YOUR PERSPECTIVE? What is the difference between a major and minor surgery? It depends, is it you or is it me? As for me, I try to keep things in perspective as I pray. More often than I willing to admit, I fail here, but I try. I ask myself, how can I worry about something as minuscule as cancer when in comparison: (1) Jesus went to the cross and bore all my sins; (2) there is an opportunity to win over one more lost soul; or (3) when there is an opportunity to be the catalyst to cause a complacent and lukewarm Christian to re-engage and fight the right fight? Don't misunderstand, I want and expect to be completely healed, but not just for me. I want to be healed for you as well. I want you to be part of the miracle. I want Jesus to be glorified. May everything, I do be for His purpose, so I never lose perspective. Jesus ends John 16, verse 33 by saying, “I have told you these things, so that in me you may have peace. In this world, you will have trouble. But take heart! I have overcome the world.” Think about these words. He told us in advance that we would have trouble, so that, in Him we may have peace. He didn’t say He would take it away and He didn’t say that He wouldn’t, just that you will find peace in Him and nowhere else. He then takes the time to dedicate chapter 17 to praying for himself, but not as a checklist of things He needs, but to point to God our Father and His glory. John 17:1 NIV After Jesus said this, he looked toward heaven and prayed: “Father, the time has come. Glorify your Son, that your Son may glorify you.” Here He reminds us that our goal is to do what He did. We are to use every life experience to bring glory to God. If only, we could remember to ask ourselves every time, “What would Jesus Do?” and then actually do it. I don’t know about you, but I need a lot of work in the 'remembering department', so that I don’t get caught up fulfilling the wrong purpose. Why would Jesus warns us in advance? Because this world is a battlefield where the forces under Satan’s power and those under God’s authority are at war. This is a real war and you are the subject being attacked – believe it. Satan wants you to join him in fighting against God and his authority. Satan will do everything and anything to distract you from your purpose. Satan will even get you to focus on your cancer (or whatever your greatest trial is – you know what it is - so name it and let go of it), rather than singing praises and thanking Him for his goodness. Satan wants you and I to steal God’s glory. Jesus prayed for his disciples, including those of us that follow Him today. He prayed that God would keep His believers safe from Satan’s power, setting them apart and making them pure and holy, uniting them through his truth. Thank you to all our “Prayer Warriors”. God loves to hear our voices in prayer! Thank you for talking to Him on our behalf, in Jesus’s name. Also, thank you for all the ‘amazing acts of kindness’ that so many have blessed us with. It is overwhelming, incredibly humbling and beyond measure. We love all of you very much, but the good news is Jesus loves you even more. In closing, I want to give a shout-out to my future son-in-law, Jarrod Markley, for inspiring the idea that we all need to “Fight for the King” and for my daughter, Heather O’Keefe, for her inspiration to use Acts 20:24 to develop a t-shirt to remind us all of our purpose, which is to bring glory to Jesus. 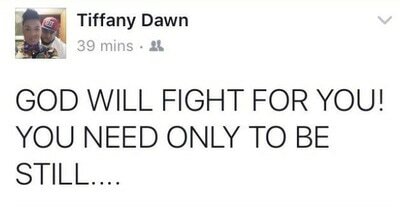 I WILL FIGHT FOR YOU, JOSHUA! In the movie "The Rookie", Jim Morris is played by Dennis Quaid. Jim Morris was feeling down until he watched a little league game and regained his passion. He showed up to the locker room and said to his teammate, "Do you know what we get to do today Brooks? We get to play baseball." I share this because once Jim Morris regained his passion, all the distractions and all the challenges were behind him. Today is Monday, March 13th. It is my youngest son Josh's, 17th birthday. While I know my true passion comes from the Lord, I want to dedicate my week of treatment to Josh. I am passionate about him. I will fight for you, Josh! Everyday I will say to myself as I receive treatment, "Do you know what I get to do today, Josh? I get to have treatment today FOR YOU!" Principal: Anything that causes you to take your eyes off the truth, Jesus, is spiritual warfare. One thing I promised to do was to blog and share my experience so others could walk with me and with the Lord. As you can see, I jumped from day 3 to day 7 and now want to go back and explain what happened to 4,5 & 6. Why haven’t you healed it? Why do I have to go through this alone? Why do I have to go through these treatments? Why have you subjected my family to this? Why have you subjected my friends to this? I am sure I am not alone in asking why? Surely, each of us at one-point in our lives has asked the question without an explanation. I was sure my question fell on deaf ears. There seemed to be no explanation. I was convinced that my God did not hear me, that he was not going to heal me, and that he was not willing. Satan had gotten into my head. Thursday morning came and I was scheduled for radiation at 8:55. I was incredibly agitated. I was tired and worn out from wrestling with God all night. Nothing had been resolved. I was convinced that my very presence at MD Anderson proved my lack of faith in God to heal me. How could I put my faith in science when the God I knew could take it away instantaneously? I told Stephanie that, it was the "what if" that made me want to leave MD Anderson and go home. In a way, I wanted to test God. Was he faithful or not? If I believed I was healed then why stay, why not just go home now. I told her that my presence was nothing more than a lack of faith and I was not going to radiation. I decided I was packing up our car and heading back to Oklahoma, because my God was the great healer and this was not where I was supposed to be. The underlying question was, “Am I even supposed to use science to extend my life and if so, at what cost? I thought, I would rather die than subject myself to this treatment. Stephanie immediately prayed over me. I told her not to, that my mind was made up. She prayed anyway. We cried. Her heart was broken. After the prayer, she asked me to go. I told her that I would go today for her, but that we were leaving tomorrow. I went to radiation at the request of Stephanie. For the first time, I did not ask to listen to contemporary Christian music and I did not pray during the procedure. I was only doing it for her. It was a task and I wanted out of it as fast as possible. I was not by any stretch of the imagination, still, which I had been up to this point. I was done and I was out of here. So, I thought! My treatment was over by 9:10. At 9:09, while I was in treatment, I received this message from Pastor Danny Duran. I immediately texted Danny back while walking to the car. Your timing is God's timing. Last night I wrote a blog to my prayer warriors to publish today on day 4. When I had finished, I wasn't sold out on what I wrote. I found myself trying to persuade others that I "am" healed and yet I was asking them to pray for my healing, no side-affects and no symptoms. I asked them, do they believe? That caused me to ask myself, do I believe? Anyway, I wrestled with God all night. I do believe God can heal me right now. I do believe He can remove my cancer with a single word or touch. Yet, I am concerned that my presence here is a lack of faith. There are millions of people who go through here and I suspect most put their faith and trust in the doctors, the machines and the process. I just can't. So, I wrestle. I went to radiation today. I don't know if I will go tomorrow. 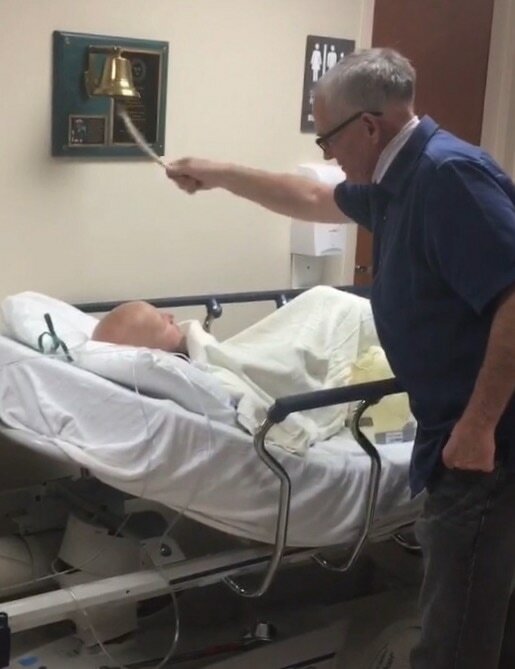 I want my witness to be about Jesus's healing hand, not MD Anderson and science. Danny went on to minister to me for some time. He filled my mind with truths and with scripture. He challenged my thinking and pushed to get me to think about the things of God. Here is some of the narrative and guidance that began to change my thinking. Danny: Tom I totally understand that. Faith is often hard to discern and follow. Some steps of faith come with a loud yes, while others come with a firm no. I do know that God uses Dr’s and that he says in Proverbs 12:15 The way of a fool is right in his own eyes, but a wise man listens to advice. I can relate to you on trusting Dr’s and the struggle with doing so. I believed that God would heal Lille completely and he didn’t need a neurosurgeon, but I felt like she was to be part of the story. She (the Dr.) in the beginning didn’t believe in miracles. But when she could only take out 75% of the tumor and went and looked after word; all of it was gone. I then understood what God wanted to do. She (the Dr.) then called Lille her miracle patient. It was one of the best parts of the whole process. The Dr’s might say that the side-affects are this and this, but I am praying that God will show them that and that!! Lille was supposed to have speech therapy and struggle with talking. Well we both now she doesn’t struggle in communicating. Ha-ha. Another sign for all to know that He is God. Instead of God healing Lille without Dr’s and it just being our story, He chose to include them and make it all our stories. He’s good like that. Tom: Then, is my walk, for others? Is it to reach the lost or to reach the weak? Am I to suffer so others can see, so they can be part of the story? I truly believe God can heal me now. Danny: He can... He may choose too! Tom: I can't imagine the pain and suffering you and Emily went through while staying faithful to Lille's healing. I can't imagine how Lille; a child must have felt. Danny: We all suffer, but we get to choose if our suffering will bring glory to Him or just to ourselves. Danny: He went on to share numerous pointed scriptures to build my faith and point me to the truth to break the stronghold Satan had on me. Tom: Clearly, I need to go open my Bible. I have allowed the attacks of the evil one to gain a foothold. He has no power over me, in Jesus's name. AMEN and AMEN! Danny: You are not in this alone, but the enemy will try and make you believe that so that you only listen to his voice. It is his greatest tool, loneliness. We all fall victim to it, myself included, but ultimately, we will Rise Against it! Because we are MORE THEN CONQUERERS!! Love you my friend! Always know that I am here, only a text or phone call away! Tom: Thanks, Danny! Thanks for your faith and shepherding. Much needed today! Danny: We are family! Forever connected! Tom: Thank you, Danny! I am so grateful for you. Thanks for being there in my weakness. God knew I needed a brother this morning. He sent you before you even knew the why. Danny: Just being obedient my friend! Glad I could help! Prior to coming to MD Anderson, I went to visit my daughter Heather, who works with Danny Duran. The Duran family has taking her in almost as one of their own. While there we had the opportunity to worship and then went to lunch with the Duran family. Lille and I have always been connected, but on this day, Lille, shared some childlike love and faith with me that still speaks to me today. On the way to lunch, Lille pulled me down to whisper in my ear, “I had cancer, now you have cancer”, as if to let me know she could relate. As I popped her in our car, she pulled me down to whisper again in my ear, “I was healed and you will be healed”, as if to reassure me. As were all parting ways, Lille, once again, pulled me down to whisper, she said, “If you die, I will be sad”, as to let me know that I matter to her. How often do we miss the opportunity to have love and have faith like a child? Here a five-year-old was ministering to me simply by being love and by being willing to share it openly and honestly. She related with me, she reassured me and she let me know that my life mattered. Her demonstration of love and faith reminds me of our Father in Heaven and how much he does the same with us. He knows everything. He knows how we feel. He knows what we need. He never leaves us. He never forsakes us. He comes to us and whispers words that give us life. All we need to be willing to do is listen. To stay in-tune with who He is and what He promises. It is so easy to get distracted by the ‘given over of our minds’ to the empty lies of Satan. All Satan wants to do is ‘steal, kill and destroy’. The easiest place to attack is our mind. Too often, we leave ourselves open to these kinds of attacks by not filling our mind with the truth found in scripture. God’s promises are for all of us. Over the last three days, a lot has happened. Satan attacked my mind. He got me to think more about me than my Lord and Savior. Thus, I found myself glorifying myself more than glorifying Him. Every word I said or every action I took seemed to magnify me instead of magnifying Him. Please understand, while in the midst of the attack, I was not aware that I was under the shackles of Satan’s attacks. However, by the grace of God, He, in his almighty power, unloaded a legion of angles we call, ‘Our Prayer Warriors’ to fight off Satan’s attacks. Even while I was consumed with myself, He brought forth, hundreds, if not thousands of people to pray on our behalf. They filled our FB, our text, our email, our blog, through my kids posts, through cards, through scriptures in a bottle, and through phone calls and videos. There was no end to the amount of prayer occurring to fight off the spiritual attacks that was destroying me. I am so thankful for all of you. I am so thankful for a faithful God. I am so thankful for Jesus and how He is the center of my life. I now know, again, that I am to walk this walk with all of you. I believe each of you is part of the story and part of the miracle. To God be the glory and may His son’s name Jesus, be magnified! Spiritual protection for Stephanie, Heather, Ryan, Courtney, Jennifer, Jarrod, Joshua, myself, my family, and my friends. Complete healing from the cancer, however God’s wants to do it. A fence of protection around my ears, my eyes, my brainstem, my esophagus, my breathing, my digestive system and everywhere else that needs protection. Ability to manage the side-affects associated with chemo and radiation. You have no idea how much this speaks to me. Every morning they snap me in and then tell me to "be still". I immediately go to my happy place and get still before the Lord. It's a challenge to breath comfortably. It's a challenge to not focus on the moment, but when they say "be still", I do. Today, I prayed the Lord's Prayer and sang the Sanctuary song over and over, until it was over. 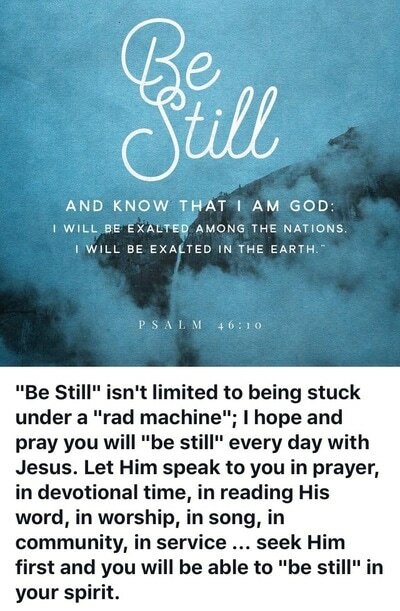 Talk about still with the Lord. It was over in a blink of an eye. 2 of 33 down. May the Lord continue to strengthen her and allow her faith to be a witness to others. I am so thankful for her and I am so in love with her. She is truly a woman of God. I pray for the Spirit of God to provide her emotional security, peace, and endurance. Ephesians 5:31-33 reminds us, “… and the two will become one flesh”. When two become one, nothing can affect one without affecting the other. Becoming one with each other frees each of us. It means to be who you are as an individual. You are also called to care for your spouse, as you care for yourself, learning to anticipate his or her needs and helping your spouse to become all they are meant to be. Sacrificial giving should be at the center of your every thought. You should not want anything for yourself, so long as, your spouse has a need of any kind. Each of us should lay down our selfish desires to meet the needs of our spouse. For me, as a husband, there is nothing I desire to do more than serve my wife by laying down my life for her. Sadly, I have failed more often than I am willing to admit. Humbly, I sit and accept my wife laying down her life for me. Anyone who knows her, knows that she has a servant’s heart so big it consumes her every waking moment. Heck, I think while she is sleeping, she is making a list of who or how she is going to serve when she wakes. She has high expectations and thus seeks to draw the potential out of herself and everyone else she knows. She leads with love, compassion, and conviction. Did I mention she leads with conviction? She never gives up! I am the recipient of her care in my time of need. I am thankful for her … so thankful. God has blessed me with Stephanie and we have become one. I feel everything she feels and she feels everything I feel before we know we feel it. Here is a quick example of her heart. Everyone knows she is a clean freak. Like, she is so committed to getting the dust and dirt off the baseboards, she is willing to take the shellac off them or she is willing to take the chrome off a sink if that means killing one more un-expectant bacteria. We arrived in Houston on Sunday at 8:00 PM. By the time, we went to bed all the counters, tables, shelves, cabinets, handles, etc. were wiped down with alcohol wipes, all the dishes were washed by hand or placed in the dishwasher, all the appliances where wiped down clean inside and out, etc., etc. Her goal was to have a sterile environment for my care. She made a germ-free haven for me. How great is my wife! If you are married or thinking about getting married, I want to encourage you to seek to serve your spouse. Learn to give up your rights for your spouse. Don’t hang on to a thread of selfish desire or pride. Don’t wait to be asked to do something, just do it. Ask yourself, if you were ever in need, who would you trust to be there for you in your greatest need? If it is not your spouse, change that now. Build into your relationship until you can say you have become one. Our “to do” was NOT a secular contract, but a spiritual decision almost 33 years ago, and it will always be. Praise be to God! Stephanie and I moved in to our apartment yesterday on a "rainy" Houston day and woke up to more of the same; but I was reminded of these song lyrics again. As I thought about Psalm 118:24 and that "This is the day", I was drawn to the reality that I am not alone. I get to be here with my beautiful wife, Stephanie, and with my Lord. How blessed am I? I get to walk this path with my soulmate and with my Savior. Now that brings great peace. Make it a great day and be sure to rejoice as today is only here for a moment and you don't want to waste even one second of it. Hug someone, love someone, hold someone, forgive someone ... but in all of that, rejoice, for this is the day, the Lord hath made! "This is the day, this is the day. That the Lord has made." Today we wrap up our visit to MD Anderson with a consultation with Dr. Fuller. He is our Radiation Oncologist. 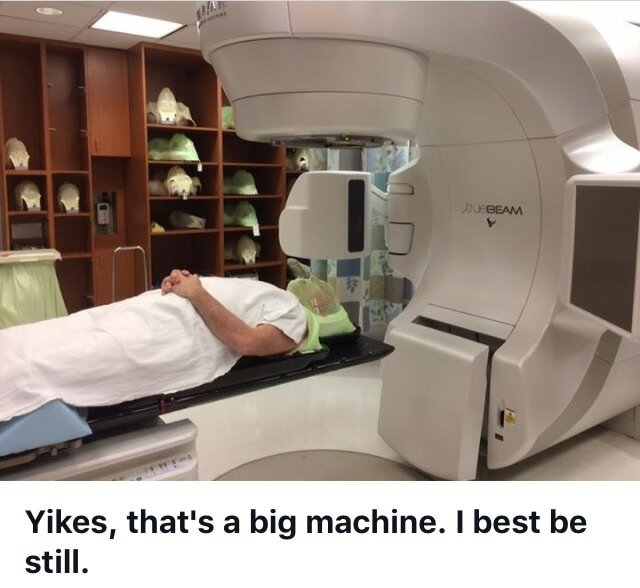 He will give us his final radiation recommendation. His level of care and concern comforts us greatly. Personally, I like him because he is matter of fact. I like the truth, nothing but the truth. We gain incredible confidence in his words. We will return on March 6th to start treatment. I was recently reminded of the scripture below by Connie Hallam and how, "The Lord will fight for you; you need only be still." These are great words. To be still means to rest in the Lord and trust that he will deliver you. These words were especially comforting yesterday as they completed a detailed MRI to develop a specific radiation plan. In fact, I had no choice but to be still. They built a mesh mask for me to wear during treatment to keep me still. 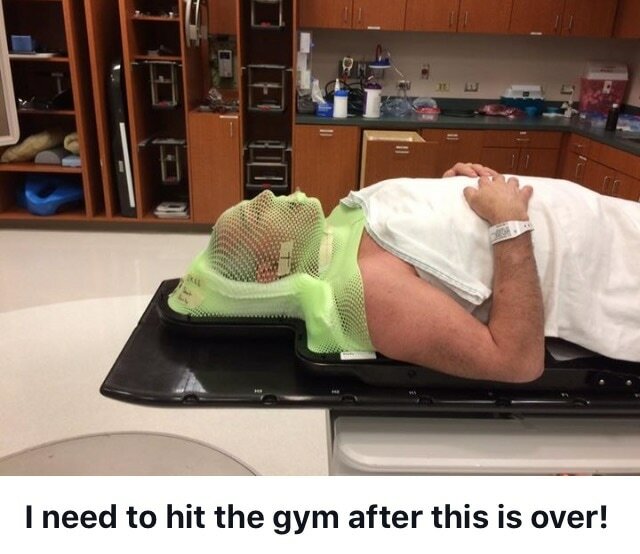 Boy did it ever, they put the mask over my face and stretched it so tight it caused my scan to poke through the mesh and it left a mesh pattern on my face when it was over an hour later. As I was lying there, completely unable to move my head, Connie's words came to mind. While I was anxious at first, these words comforted me and helped me to be still, not only during the MRI, but also in my spirit. I simply asked the Lord to give me peace and comfort and He did. He delivered me from my own anxiety. I was able to cast my fears on Him and he received them. As you read the scripture below, please notice the response of Moses and the people of Israel. They sang, they rejoiced, and they exalted His name for the victory He had given them. My request and prayer for all of my family and friends are to join us and sing, rejoice and exalt His name for His victory. God is so good and the only reasonable response to any storm or challenge is to give Him the glory. He will use it for good. We love you all and pray that your faith is increased. Thanks for walking with us and for your prayers.